In terms of the quantity of wine produced and the reputation that comes with their most famous vineyard holding, Couly-Dutheil is probably the most instantly recognised name in the Chinon appellation. The history of the domaine however is relatively recent, dating back to 1921 and representing four generations. The associated story is an intriguing one since it is built upon a very close relationship between two families who originated in the Corrèze; one of the most impoverished departéments of France. The first to depart the Auvergne was Jean-Baptiste Dutheil who arrived in Touraine in 1820 by way of a dog-cart and he was soon joined by his cousin, Camille Couly. Neither had any involvement in wine Jean-Baptiste employed as a metal-worker. The viticultural connection came only with his grandson, Baptiste, who relocated to Chinon after the Great War. Born in Chinon in 1880 (his parents were visiting the family at the time), Baptiste was raised in the Auvergne. He would have been 41 when he opened the doors to his wine merchant business, marrying his cousin, Marie Couly soon after his arrival in the town. In 1925 he turned from being a merchant to a vigneron after acquiring the top portion of the Clos de l'Echo vineyard (although it was not known by this name at the time). René Couly was a distant relative who was born in the Corrèze in 1910 and came to Chinon to work the 1928 vintage with Baptiste. Having originally been employed by a négociant in Bordeaux (the Moeuix family of Château Petrus who also originate from the Corrèze are cousins), he relocated to Chinon after falling in love with Madeleine, the daughter of Baptiste and Marie, thus creating the name of the domaine as we know it today. It was very much René who developed the domaine, buying the remaining half of the (then fallow) Clos de l'Echo in 1951. The couple had two boys: Pierre and Jacques, who would go onto run the domaine between them after René retired. Pierre worked his first harvest with his father in 1959. By the end of the 1970s the family controlled 40ha of vineyards and had contracts to buy 65 hectares more, positioning them the largest single producer in the appellation. During this time they were also building up the négociant side of the business, having rights to sell and distribute the wines of other Chinon producers, including Domaine des Bouquerries, Domaine du Puy, Domaine de la Semellerie and Domaine de Versailles, coincidentally all located in the commune of Cravant. By 1989, the firm was significant enough to allow it to consolidate its winemaking facilities to one central cellar in the town. Although the adjoining caves that were first quarried in the 12th Century, the newly constructed cellar was considered as state-of-the-art for the time since it introduced computerized pneumatic presses and thermo-regulated stainless steel tanks to the region for the first time. The succession of the fourth generation began with the arrival of Bertrand, the son of Pierre, in 1986 after completing studies in Montpellier and working harvests in Pomerol, Châteauneuf-du-Pape and in Oregon. Arnaud, Bertrands cousin, the son of Jacques, joined the family business with a commercial diploma a decade later. But as with many close-knit families, situations often come to a head and by the start of the last decade issues began to arise between the two Couly factions which ultimately led to a division of the two camps resulting in the departure of Pierre and Bertrand (Bertrand would rather use the word 'eviction') during the mid 2000s, leaving Jacques and Arnaud to continue running the domaine. Having only discussed the situation with one half of the protagonists, it would be unfair to be seen to be taking sides, but the problems seem to stem back as far as 2000 over an initial dispute over picking dates (Pierre advocated early harvesting, whilst Jacques and Arnaud wanted to produce riper wines, presumably aimed at satisfying the needs of a changing marketplace). In 2003 the two families bought in a consultant (probably to act more as an arbitrator) and a decision was made to dispose of all the wood in the cellar in order to concentrate on producing more site specific wines, whilst reducing yields and harvesting later (Jacques Couly now claims to harvest one week later than the average for the appellation). Some commentators have made the point that the family started to loose focus and direction after the death of René Couly, who must now be turning in his grave at the thought of the conflict that now exists between his sons and their respective off-spring. Even after five years, the situation remains unresolved with Pierre and Bertrand laying claim to several vineyards still under the control of Couly-Dutheil, whilst lawyers continue try to put a figure to the company's value which is acceptable to both parties. In the meantime, Pierre and Bertrand have decamped to the edge of Chinon, constructing their own cellar and now are now beginning to establish their own identity (see separate entry). Today, Couly-Dutheil owns a total of 87 hectares (expect this figure to diminish should the issues outlined above ever finally get resolved) and have a further 120 hectares under contract. With over 200 hectares and with a production of around 100,000 cases annually, the firm is responsible for around 10% of the appellations output. The range of wines produced at Couly-Dutheil is enormous, although it must clearly be a successful formula for it to survive as it does. At my visit to the cellars in April 2011 there were a total of twenty different wines on offer (not all of them Chinon), ranging from the profoundly serious (Le Clos de l'Echo and Le Clos de l'Olive) to the mundane and curiously fabricated (such as their Blanc de Franc, a Cabernet Franc vinified white). Not all the wines are featured in my tasting notes below (which concentrates on the haute gamme and older vintage only), but what follows is a summary of what Couly-Dutheil produce, beginning with their most prestigious asset. I suspect that most consumers first experience of the appellation (or even Cabernet Franc from the Loire) is via a bottle of Couly-Dutheil Chinon and the company rightly deserves its reputation as the definitive producer in the appellation. Yet for those interested in wine beyond the point of drinking it as any other beverage, the majority of Couly-Dutheil's offering is pretty pedestrian. There are few finer wines in Chinon than a great old bottle of Le Clos de l'Echo, but the reality is that I wouldn't go out of my way to imbibe the other four-fifths of their output. ‘Oui, les femmes de Chinon’. During the late 15th and early 16th Century, the land was said to belong to Antoine Rabelais, the father of François. The top portion, on the plateau, was bought by Baptiste Dutheil in 1925. The site had been abandoned after phylloxera had struck and it was only cleared and planted once more in the early 1930s (the vines from this era being grubbed up in 1985/6). 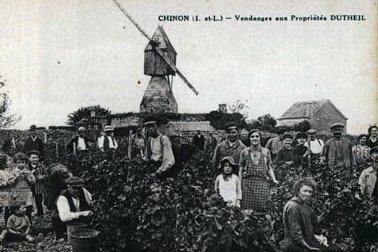 For the first couple of vintages the wines were sold as Chinon Moulin-à-Vent, named after the windmill that stood in the middle of the vines (opposite). The title was subsequently dropped after objections were raised from growers in Beaujolais. Regardless, since the Moulin had been destroyed and dismantled after a thunderstorm, it was renamed Le Clos de l’Echo. The southern part of the slope was acquired by René Couly in 1951 who cleared, drained and commenced planting one year later. Before this, the land was used only for growing cereals, as documented in an older aerial photograph of the fortress and the town (below). Not classified as a vineyard in the original decree of 1937, its 17 hectares were recognised by the I.N.A.O. (Institut National des Appellations d'Origine) retrospectively. The Clos de l'Echo enjoys a mostly southern exposure, with around five hectares on the plateau orientated northwards. For such a large parcel, the soils here are surprisingly homogenous, made up of clay and clay-limestone which contain pebbles of quartz. Being the highest point of the commune, the clos enjoys a commanding view of the fortress and the valley of the Vienne; justifiably claiming its position as one of the most distinguished sites of the appellation. It is a monopole of Couly-Dutheil (although parts remain in fermage) and mostly planted to Cabernet Franc, but there is a little Chenin here too. Production during the late 1990s was around 80,000 bottles a year, but changes made at the domaine during the early 2000s saw the volume fall as lower yields were sought. In 2007 only 27,000 bottles were produced. Since 1995, a separate wooded cuvée has been produced (there was none in 1998, 2004 or 2007) under the name of Crescendo. Said to originate from the oldest vines at the heart of the clos, half of the blend is aged in new oak for 12 months, the balance being raised in tank. Considered a controversial decision by some commentators from the start, \i understand that the future of the wine is now 'under review'. The Clos de l’Olive takes its name from Baron Charles de L’Olive-Noiré, conqueror of the Guadeloupe in 1635 and who once owned the property, although it has also served in its past as a refuge for lepers. It was acquired by René Couly in 1951, around the same time as he purchased the southern part of the Clos de l’Echo and was replanted in the 1970s. Some of the vineyards original 100 year old-plus ceps still remain. The vineyard is a reasonable three hectares in size and is a ‘true’ clos in that it is situated within its own walls. It is one of the first vineyards to be encountered as one negotiates the D21 towards Cravant, where it sits on a gentle south-facing slope. At the top the soil is clay-limestone but by the time one descends to the foot of the clos the profile has changed to sand and gravel. The vineyard here is harvested later than in the Clos de l’Echo, a function of the vines being grafted onto 41B rootstock which delays the ripening process. Today, Le Clos de l’Olive is the home to Pierre Couly, although ironically, the rights to the name rest with Couly-Dutheil, where it forms part of the firm’s haute-gamme. The wines from this sight are often the equal of Le Clos de l'Echo after a decade or so in bottle. La Diligence began life in the early 1990s (I have older notes on the 1993 and 1994 vintages) as a 6.5 hectare lieu-dit purchased in conjunction with a group of celebrity foodies, including local legend, Jacques Puisais. Located in Beaumont-en-Véron, the name appears to have evolved over the years from a single site to that of a marque (brand) which has since been registered and possibly undermined by Couly-Dutheil. Les Gravières is the single largest blend produced by the firm, accounting for around 10,000 cases each vintage. It is sourced mostly from their own vineyards but also from bought-in grapes from the low-lying plains in Cravant. It is the lightest and simplest of the Couly-Dutheil reds. La Baronnie Madeleine takes its name from Pierre and Jacques mother and was created in 1978. In theory, it is produced only in the better vintages; the most recent releases being 2005 and 2009. Domaine René Couly is self explanatory, and is sourced from 18 hectares of vineyards on the argilo-siliceux soils mixed with above Saint-Louans. Le Chanteaux is a Chinon blanc, added to the range in the early 1990s. It is sourced from six hectares of Chenin planted in Les Molières. The wine is raised in tank and bottled after around six months without any malo-lactic fermentation. Earlier vintages of this tasted more like Sauvignon Blanc, presumably manipulated with specific strains of yeast. Thankfully, more recent examples have at least shown some sense of place again. Chinon Rosé account for around 10% of the total production (around 1,000hl a year) and the Couly's prefer a technique of maceration over the more widely adopted saignée or pressurage direct. In addition to the above, there is also a Saumur Blanc Les Moulins de Turquant that is sourced from 3 hectares of Chenin and, since the 1996 vintage, a Saumur-Champigny which carries the same name and is from eight hectares owned in the commune of Turquant. Nègociant wines still account for an important part of the production and include a Touraine Sauvignon Blanc, a pair of sparkling wines, a Bourgueil and a Saint-Nicolas de Bourgueil. Mid-pale. Orange-brown rim. Mature. Delicate and complex. Pretty on the palate. Light and gentle with good freshness. The acidity shows through even if the fruit has now been lost. Elegant. Just a little dry and grippy on the finish. Decent for a modest cuvée.